Xan Staraider turned his life around, abandoning his misspent youth as an Anti-Ganker to take up Catalyst and Code. 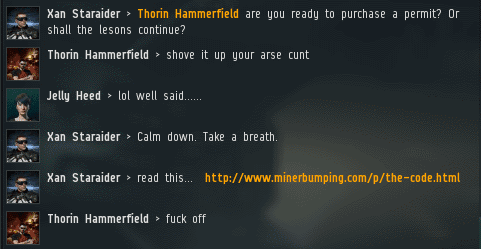 Agent Xan hoped to share the benefits of the Code with non-compliant miner Thorin Hammerfield--only to run afoul of Jelly Heed, a practicing anti-Code rebel. Despite her best efforts, Jelly had failed to stop Xan from ganking Thorin Hammerfield. Now she wanted someone to blame. Jelly was convinced that Semaj Cay Erquilenne was secretly working for the New Order, instead of AFK mining like he was supposed to. 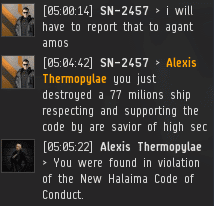 Xan swiftly resolved the dispute. He didn't want any distractions; he preferred to spend his 15-minute criminal timer quietly preparing for the next gank. 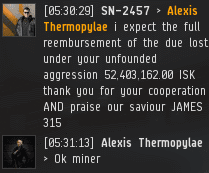 Miners always complain about not being warned, so Xan offered a warning to every miner in the system. But Jelly was making preparations of her own. 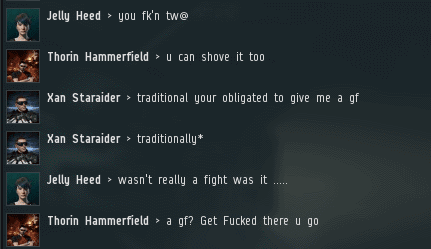 She'd failed to stop the last gank, and she had no intention of being humiliated again. 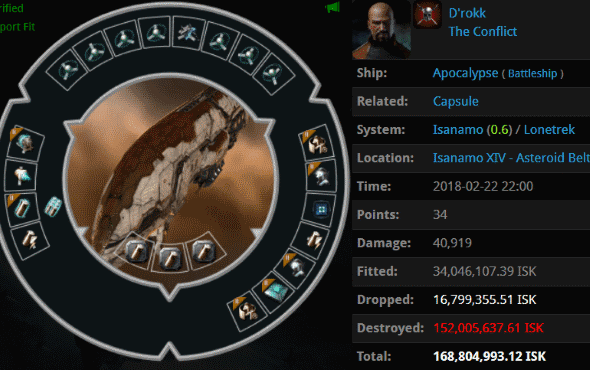 Xan undocked and launched his Catalyst back into the field of battle. Now was the moment of truth. Zounds! 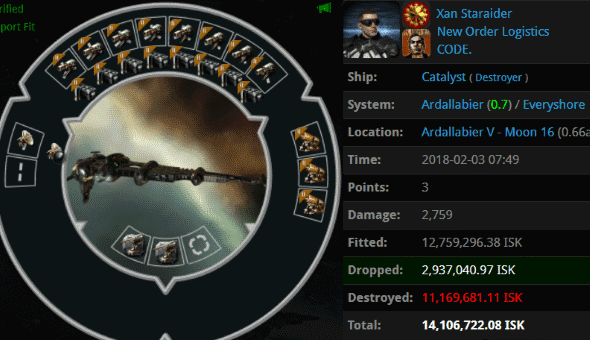 Agent Xan's Catalyst was ganked! Prior to exploding, the Catalyst had destroyed its target. Once again, Jelly failed to prevent the gank. She was as much of a failure as all of the other Anti-Gankers. The entire system witnessed a timeless truth: The CODE always wins. Always! Jelly stewed. She'd sworn to herself that she'd never be humiliated by Xan Staraider ever again. Yet here she was. Fellow anti-Code carebear Firebase tried to support Jelly by pulling the old "ships that can't shoot back" line. 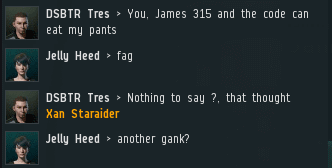 Because Jelly's alt had fired upon Xan's Catalyst, Firebase only made things worse, by drawing further attention to the Anti-Ganker's failure. Jelly winced. 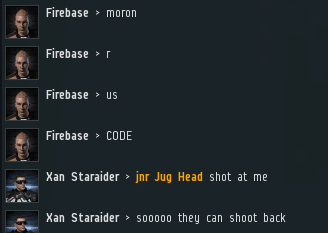 Firebase calmly raged in local. He was so indifferent to the situation that his hands trembled and his eyes turned red. Smoke contentedly shot out of his nostrils. Xan looked upon the rebels with pity. He used to be just like them. There was no need to make a confession; his own history wasn't the important thing. The Code was. Jelly and her fellow rebels insisted that disobeying the Code wouldn't result in losses. Xan knew better--and so did everyone he killed. After his 15-minute timer expired, Xan returned to the ice field. Incredibly, the pod of the Retriever he'd just ganked was still sitting there. 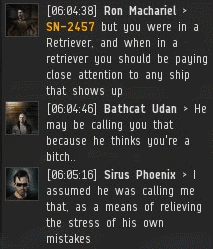 So the Retriever pilot lost 100 million isk worth of implants, too. Where were the rebels who just moments ago had declared the irrelevance of the Code? Nowhere to be seen. Pop quiz, dear reader: Spot the ganked miner. Thorin Hammerfield's Covetor was popped by a pair of Catalysts piloted by Agents Zen Stenier-Tian and Xan Staraider. 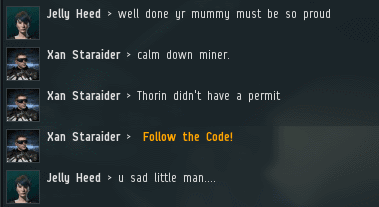 Jelly Heed tried to warn Thorin, but the miner failed to... heed... her warning. 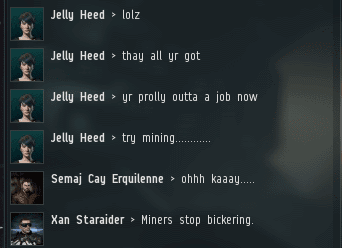 Jelly also went so far as to try intervening in the gank, but the miner died anyway. Xan Staraider knew of what he spoke. 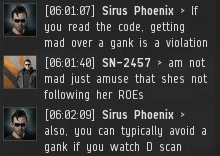 A former Anti-Ganker himself, Xan was all too familiar with the futility and emptiness of trying to prevent the Code from being enforced. Like so many other rebels, he switched sides and began to enforce the Code himself, making him a controversial figure in both pro-Code and anti-Code circles. Jelly was apparently the system's local resistance leader. She was disgusted by the rebel-turned-Agent and his ability to succeed at doing things rather than failing. Yes, she was disgusted, or, perhaps... jelly? Xan and Jelly continued to discuss Thorin and his problems. If the miner was still in the system, his ears were surely burning (along with the wreck of his Covetor). Yep, still in the system. Thorin had put his safety into Jelly's incapable hands. He had not, however, delegated his rage. Thorin continued talking--with the inevitable result of alienating the locals. Only Jelly was willing to defend the miner, and she'd already proven herself distinctly unqualified for the job. By contrast, Agent Xan seemed to be cultivating new friendships. This is a typical pattern: Agents and miners both tend to push people into the New Order camp. But would anyone trust Xan once they learned of his dark past? Previously, on MinerBumping... Mission Ready Mining's mining colony in Gelhan was melting before our Agents' very eyes. The miners blamed everyone but themselves for their failure; they cursed the mighty CODE. alliance--and The Marmite Collective for allegedly colluding with them. MRM's leaders hoped that our Agents would get bored and go away, but instead, they settled in and made the system their home. From time to time, seemingly momentous threats arose, only to fizzle out. Could nothing stop our Agents? 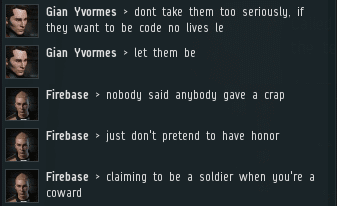 Agent Kalorned found few MRM members willing to fight. Instead, he was spending most of his time administering the empire. Luckily, Kalorned was able to delegate. 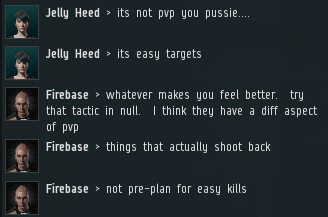 After seeing so many miners fume about kill rights on -10 security characters, it was refreshing to see people who knew how to use them. Kalorned noticed that some of his familiar foes no longer belonged to MRM. Regardless, our hero vowed to protect Gelhan from all threats, from the mundane to the exotic. Agent Kalorned was tending to the Gelhan system when a strange visitor arrived. Something seemed a bit off about this fellow, but Kalorned wanted to make the guest feel at home in Gelhan. HoleySheet1 > who are the good guys? Maybe Kalorned's first impressions were wrong. Had he judged HoleySheet1 too harshly? On the other hand, Agents of the New Order are known for their superb instincts. Kalorned received additional insight from a member of MRM; he was routinely supplied with information from some of its more open-minded members. Though HoleySheet1's reputation wasn't stellar, Kalorned felt it was worth spending a few more minutes with him. However, the visitor was eager to be on his way. 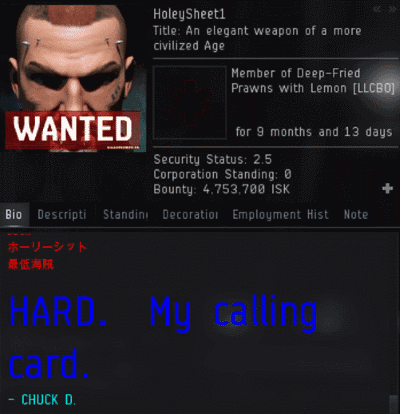 Kalorned only had time to play one more card: The name of the Saviour of Highsec. Drop it into any conversation and you're bound to get to the truth. What Kalorned didn't anticipate is that this time, truth would come in the form of a conspiracy of epic proportions. There were several contenders for the worst miner of the week, but Tolik West's bling/capacitor Covetor took the prize. 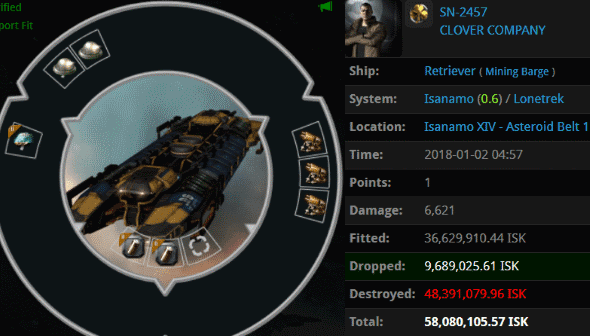 How do you lose over half a billion isk on a ship this bad? Agents Zen Stenier-Tian and Xan Staraider brought the miner to justice. 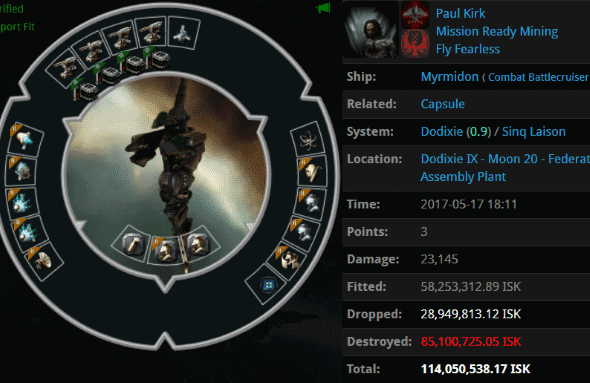 We see a lot of blingy mission/ratting ships, but they don't often exceed 4 billion isk. 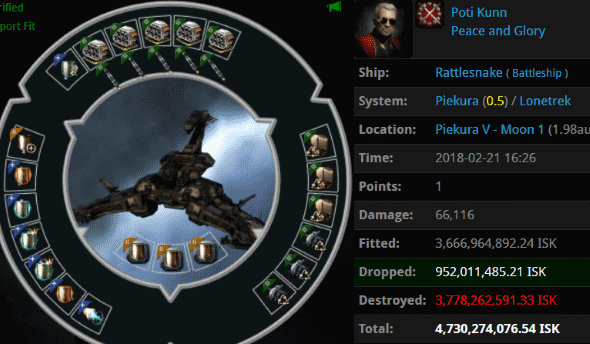 Poti Kunn managed to lose 4.7 billion on his Rattlesnake. All those shields did him no good against the firepower brought by Agents Archibald Fizzleblade, Hagen Fizzleblade, Hermann Fizzleblade, Jack Fizzleblade, Matt18002, Gottfried Fizzleblade, Lutz Fizzleblade, Franz Fizzleblade, Walther Fizzleblade, Erich Fizzleblade, Karl Friedrich Fizzleblade, holdmybeer, Emotion Sasen, Daniel Chanline, erobb, tumblr ptsd, patyooki, James BIG BONED, Shy Elf Trap, PogChampion, oink piggu, brainlet, and Serious Web Developer. ...Yup. There's a difference between smarts and smartbombs. 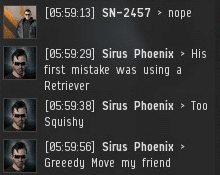 D'rokk was attempting to prevent the gank of a Retriever by smartbombing a group of Catalysts. 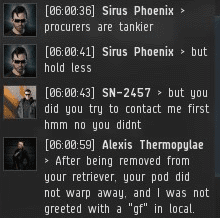 Not only did D'rokk get himself CONCORDed--losing far more than a Retriever's worth of isk--but he also failed to save the Retriever. 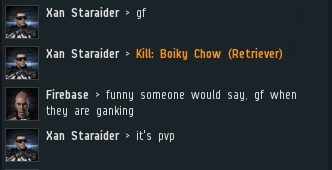 It seems the only time these Anti-Gankers ever crawl out of their holes is to fail. Once again, the jump freighters got hammered this week. When will they learn to stop feeding us kills? 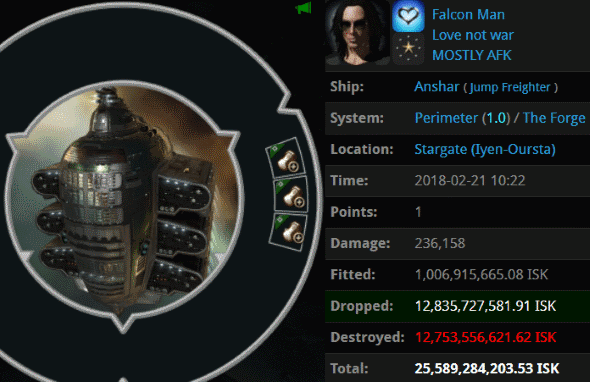 Falcon Man of the MOSTLY AFK alliance lost a 25.5 billion isk Anshar in a 1.0 security system. 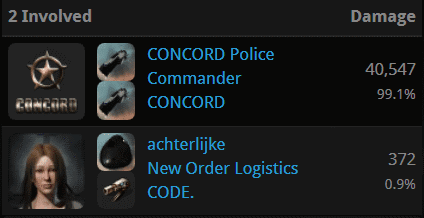 Our Agents seem to enjoy the challenge of a quick CONCORD response. The roll of honour: Agents Pod Destroyer Molly, Tax Collector HongMei, Dead Blue Whale, Taxman Daniel, Dead Black Whale, Tax Collector Kittens, Dead Gray Whale, Dead Scarlet Whale, Dead Geen Whale, Tax Collector Hill, Dead Orange Whale, Dead Red Whale, Tax Collector BokChoy, Tax Collector KarlMarx, Tax Collector Aruka, Tax Collector Max, Tax Collector Richard, Tax Collector Stroheim, Dead Purple Whale, Tax Collector Kimi, Tax Collector Buck, Dead Yellow Whale, Tax Collector Alison, Dead Pink Whale, Tax Collector AynRand, Tax Collector Larry, Tax Collector Shardani, Australian Excellence, Tax Collector Yuna, Tax Collector Fuemi, Ektallion, Mining Lord 1999, and Ding Dong MingMong. 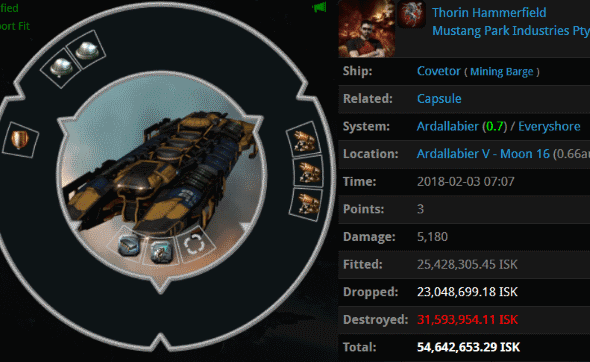 Killing 20 Hulks in one go? Magnificent. 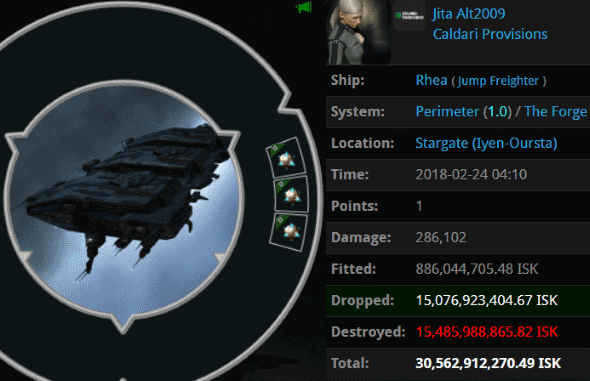 If her character name is to be believed, Jita Alt2009 comes from a time before there was a Code. 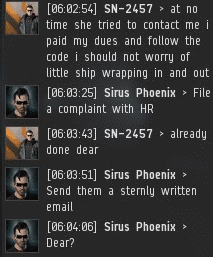 Our heroes gave her a taste of how much highsec has changed--to the tune of 30.5 billion isk. Ouch. I'm sure the carebears would like to say, "That loss has already been replaced," except our fleets would simply gank the replacement. Agents Tax Collector Max, Tax Collector HongMei, Jayson Kusion, Tax Collector Richard, Jason Kusion, Justin Kusion, Taxman Daniel, Tax Collector KarlMarx, Australian Excellence, Tax Collector Aruka, Tax Collector Kittens, Jake Kusion, Tax Collector BokChoy, Joel Kusion, Tax Collector Stroheim, Jayden Kusion, Tax Collector Kimi, Joseph Kusion, Joshua Kusion, Tax Collector Larry, Tax Collector Yuna, Jackson Kusion, Tax Collector Alison, Tax Collector AynRand, Tax Collector Hill, Jeremiah Kusion, Tax Collector Shardani, Johnathan Kusion, Tax Collector Fuemi, The Confiscator, Tax Collector Buck, Pod Destroyer Molly, Ding Dong MingMong, Ektallion, and Mining Lord 1999 demonstrated extraordinary heroism and elite PvP skill with this kill. 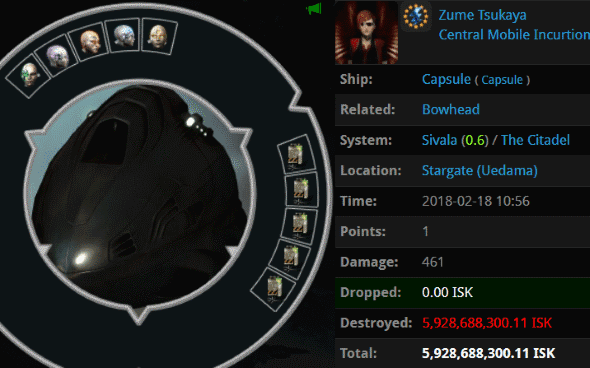 Zume Tsukaya decided to blow 5.9 billion isk on implants for a character that spent its days AFK hauling on autopilot. 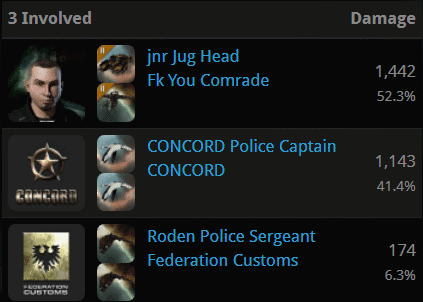 Once Zume lost her 15.7 billion isk Bowhead, Agent Baron Rozei took away her implants, too. She didn't deserve them. Hmmm... 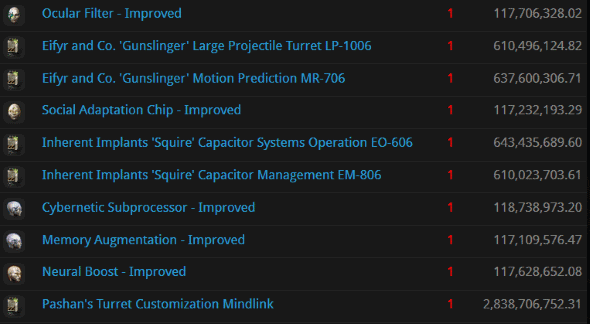 If Zume was flying a "ship that can't shoot back", then why did she spend so much money on gunnery implants? "WTF"--also known as the "carebear hello". And this is how we say hello in the New Order. 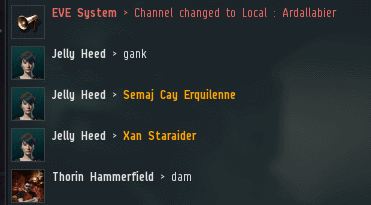 Plot twist incoming: Upon being ganked, SN-2457 announced that he was a permit-holder, threatened to report the ganker to the Agent who sold the permit, and proclaimed his allegiance to the Saviour of Highsec. 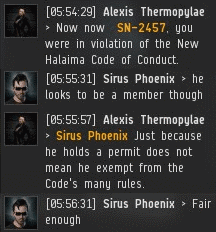 Agent Alexis Thermopylae wasted no time in declaring the miner in violation of the Code. Just like that, the battle lines had been drawn. SN-2457 wanted to go on record in front of everyone in Isanamo local. The miner dug in his heels. After all, digging is what miners do. Agent Alexis didn't sweat the miner's accusations; she knew that it was a good kill. But the commotion in local chat attracted attention. 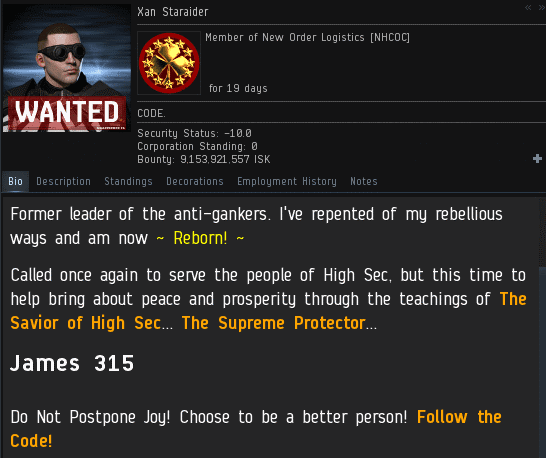 Everything about the New Order attracts attention, because we're what's going on in EVE these days. Then SN-2457 made the fateful decision to become a martyr. He tried to turn the destruction of his Retriever into some larger point about the Code. It was pure propaganda. 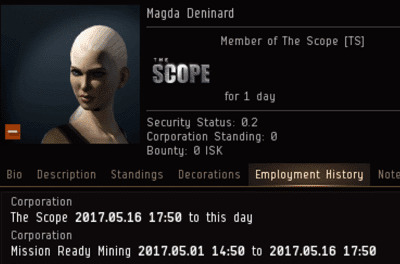 Would this miner succeed in deceiving highsec? Alexis had caught the miner red-handed. He'd been mining in a fail-fit, untanked Retriever. And by all indications, he'd been AFK, too. Worse yet, he lied, openly challenged the authority of an Agent of the New Order (a member of the mighty CODE. 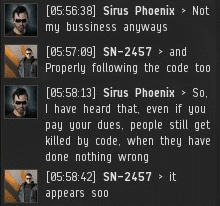 alliance, no less), and tried to smear the Code. Interestingly, the locals weren't giving SN-2457 any sympathy. 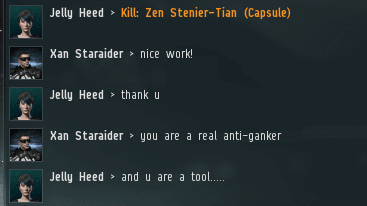 Remember the old days, when any random onlooker would immediately side against the ganker? How things have changed. 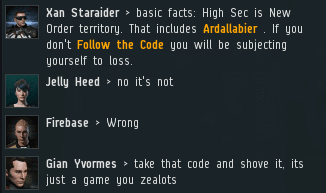 One of the reasons for the shift is that the Code is fundamentally a part of highsec culture now. 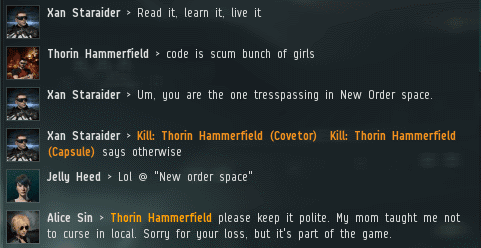 EVE players know about it, they read it, and they take it as a given that it will be enforced. SN-2457 grew frustrated as he realized he wasn't gaining any support from the locals. He began to lose his composure, letting his "Gallant miner" mask slip. Ultimately, the locals all turned against SN-2457, one after another. It's remarkable: They watched a permit-holder get ganked, they considered his conduct, and they correctly judged him to have been in violation of the Code--and to blame for his own loss. There's a word for that: Progress. Hearts and minds, ladies and gentlemen. Hearts and minds.